Anything about browser themes, both Full Themes and Lightweight Themes (personas) should go here. Andhika24kd wrote: Pale Moon title (before the website title) goes too close to the Pale Moon dropdown menu when Pale Moon is not maximized. Can't confirm this. Are you using any other extensions or stylings? If so please disable and try again. This is actually inherited from Australis code, so I suppose in that sense it's "as-intended". This is because of the way the uBO button is created, as it also creates an (invisible) dropmarker to signify it's a menu icon, which is why we add the extra space at the end of it. You can work around this by placing the button in the statusbar instead. LimboSlam wrote: Has the margins been fixed for the exit button? Thanks again for the release! I finally got round to doing this, sorry for the delay. I've released v4.0.2. Australium has been updated to v4.1.0! In this release, we add Pale Moon 28 support, in addition to syncing the theme in general with Basilisk's default theme. This mostly has an effect on Windows 10, which now has coloured titlebars. There are weird lines over the tabs with this update. 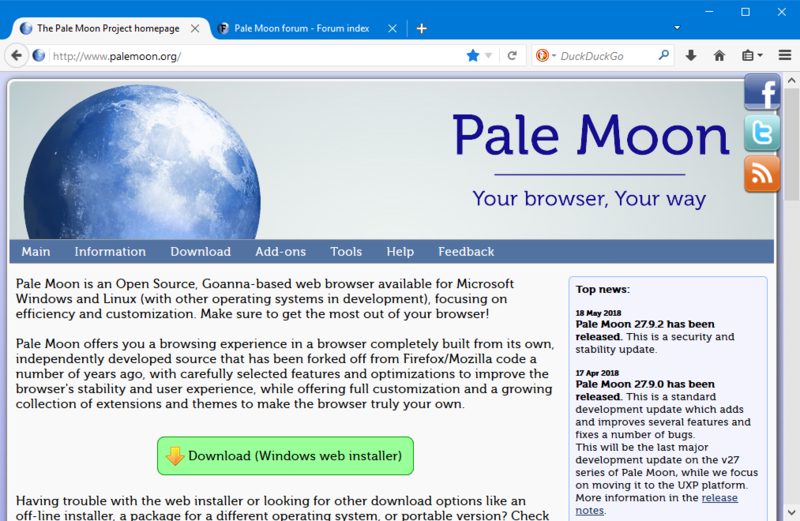 I'm in Pale Moon 27.9.2 x64 in Win 10. Also, the download icon dissapears after downloading something. This problem has been there since a long time ago. There are two downloading icons, but I don't know the name in English of the one I'm using, maybe is "Download status". Last edited by José Labán on 2018-06-08, 02:04, edited 1 time in total. Yes, I too am seeing these weird lines. Huh... The other day, without a theme on Basilisk, I was seeing tiny little bumps on the tops of tabs in those positions (but not on Firefox). Weird. Also since this is the Australium thread, obligatory: You made a really nice theme Lootyhoof, I don't use it all the time but it's quite good. Australium has been updated to v4.1.1. Thank you. It's fixed now. Just the problem with the Download Satus icon linger. Whoops, sorry about that. Australium v4.1.2 is now live. Now it works just perfect. Thank you very much. maybe a stupid question: How can I get back the grey titlebar? Is it just me, or is there a part of the go back button that is sticking out a little too much? The Australium theme, on Windows, is a thing of Beauty! But on Linux it's less so. Why is this the case? I am particularly interested to hear if it's possible to get the same "close buttons" on Linux than you have on Windows? Below is a pic of how it looks on WIndows. Would it be possible to get the same look on Linux? Australium has been updated to v4.1.3. fatboy wrote: I am particularly interested to hear if it's possible to get the same "close buttons" on Linux than you have on Windows? This actually should work in any theme (including default), for anyone that's interested. Lootyhoof wrote: Australium has been updated to v4.1.3. Awesome! Thank you so much LootyHoof! Champion! Will have a look at my Linux PM and Basilisk tonight. I have created userChrome.css file in /home/user/.moonchild productions/pale moon/h0h89k2i.default/chrome/userChrome.css, but my australim still looks like it did before the tweak. I can see a slight difference in the default theme, but the close buttons still look the same. My question is, can one make the Linux theme look like the Windows theme (in particular, the close buttons)? Last edited by fatboy on 2018-06-20, 01:58, edited 1 time in total. Hey LootyHoof, is there a way to make the download button more visible when starting a download or when it completes? Such as the green flash you get with the default theme. It's kinda irritating as the whole family finds it hard to identify, or even as a reminder that they did download something. After a download complets, this can suffice as an indicator. Alternatively, you find a better balance. Something similar to this setup..without the gray background and all, because colorful toolbars are amazing! And yes, I have messed with about:config and accent colors to improve the icon appearance, but nada. Last edited by LimboSlam on 2018-06-20, 08:09, edited 3 times in total.